Please do come and visit or call us and speak with one of our friendly team for more information about weekend workshops, day and evening courses, sewing, textiles or art at KHY. There is free parking at the front of the Mansion House and you will find us at the front of the building, through the main door, first left near the Ladie’s loos. We describe our space like a magpie’s nest – an eclectic mix of arts & crafts and sewing. Entrance is directly opposite Beckenham Hill train station. Our information hotline is open 9am-6pm. Office Hours 9-6pm. Evening Classes until 9pm. Please be aware that your Sat Nav may not take you to the right entrance, some people have ended up in residential roads. 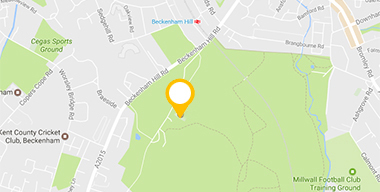 A good landmark to look for is Beckenham Hill train station, the park entrance is opposite. There are also a couple of bollards in the road just in front of the park gates. Turn into the park and keep driving or walking along the long driveway, eventually you will find the building and you can park for free right outside. Bus 54 stops directly outside the main park. Beckenham Junction Station is just a brisk, short walk away too.